The word swingopis is derived from the Slovene word for newspaper (časopis). 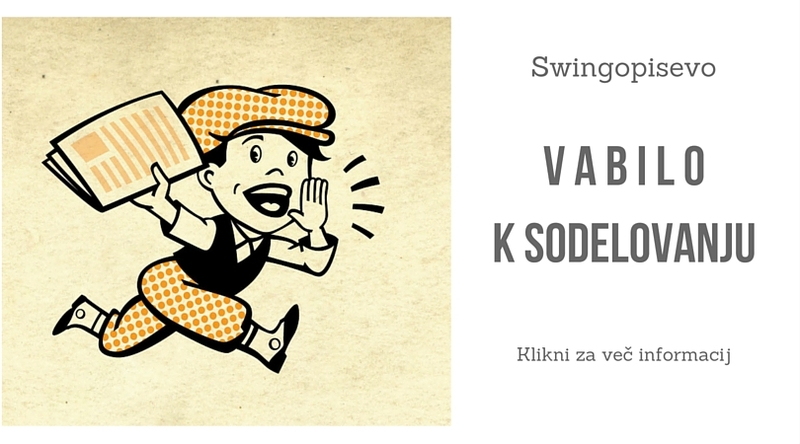 Here you will find some general info on swing dancing in Slovenia. In the Columns you will find articles written by our dancers, explaining their own thoughts on dancing. You can also find some useful links to other swing related sites. If you’re looking for a place to dance the night away, look no further than “Where can I dance?” link. We will also let you know about the wonderful world of dance camps and workshops at home and abroad. And that’s just the beginning. You are welcome to take part in creating Swingopis by sending us your thought, articles, suggestions and ideas to swingopis@gmail.com.